WASHINGTON (AP) — As the shutdown of the federal government lumbered toward an end on Monday, President Donald Trump remained out of sight, suppressing his instincts to make himself part of the story by making a deal or picking a fight. Trump told allies over the weekend that he hated being on the sidelines, but he followed the recommendations of his staff and key congressional Republicans and removed himself from the negotiations. The president limited his public pronouncements to a few Twitter bursts that bashed Democrats. He did not reach out to Senate Minority Leader Charles Schumer or any other Democrat, instead calling fellow Republicans and Cabinet members to check on the response to the shutdown. The White House defended Trump’s hands-off approach to the negotiations, one out of character for a president who made his reputation as the master of “The Art of the Deal,” as he titled one of his books. 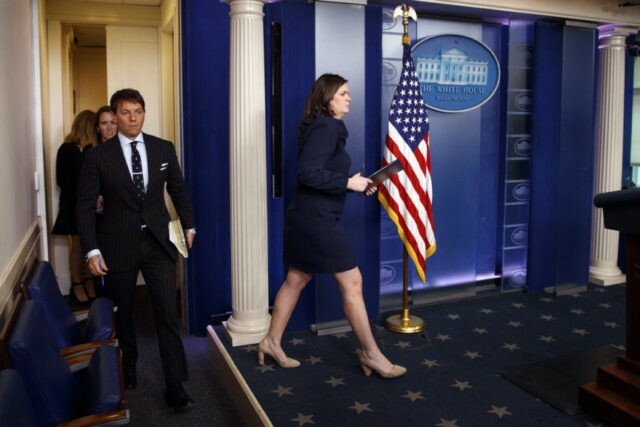 “Look, what the president did clearly worked,” said White House press secretary Sarah Huckabee Sanders. She told reporters that Trump’s focus was on minimizing the impact of the shutdown on Americans. Trump’s shifting positions, particularly on protections for young immigrants, twice scuttled deals that could have avoided the shutdown, frustrating Republicans and Democrats alike. Schumer, who believed he was close to a deal on Friday after meeting the president at the White House over cheeseburgers, blasted Trump’s refusal to re-engage. Trump initially chafed at remaining out of the fray, grousing to aides and outside advisers that he feared taking the blame. He watched hours of coverage of the shutdown on cable TV over the weekend — including clips of him blasting President Barack Obama for being passive during the 2013 shutdown — and made a series of calls to allies in which he expressed fear he was looking weak, according to a person familiar with the conversations but not authorized to speak about them publicly. But Trump was pleased with the work of his staff defending him on air and was warned by allies, including chief of staff John Kelly, budget director Mick Mulvaney and House Speaker Paul Ryan, not to reopen negotiations with Schumer, whom White House staffers believed would have to fold. Instead, the White House released a series of staged photos of the president, including one in which Trump wears a “Make America Great Again” hat and holds a phone to his ear while sitting at his Oval Office desk.